Chew Valley Green Pages is the essential business and community directory for the area between Bristol, Bath and Wells. It is published annually by The Chew Valley Gazette. The first issue was published in 1986. Barrow Gurney Bishop Sutton Blagdon Burrington Butcombe Chelwood Chew Magna Chew Stoke Churchill Chewton Mendip Clutton Compton Dando Compton Martin Downside Dundry East Harptree Farmborough Farrington Gurney Felton Hinton Blewett Langford Litton Marksbury Nempnett Thrubwell Norton Malreward Pensford Priddy Redhill Regil Stanton Drew Sandford Stowey Temple Cloud Ubley West Harptree Whitchurch Village Winford Woollard and Wrington. See the maps page. It is distributed free to households through out the area. The next issue will be 2018-2019 and will be published in September 2018. Some advertisers' website addresses have been provided with live links, and some have not - in each case, the choice was the advertiser's. 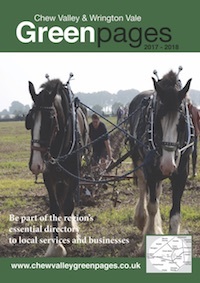 Chew Valley Green Pages is a once a year publication. The website however has the availability of change. If you would like your business or community group added via a web link call the office on 01275 332266. The website was constructed by Tavy Web Design following the original design of Rowland Janes in 1985 and first published in 1986. Please send any communications regarding advertising on this site, booking etc, to [email protected]. Please send any communications regarding the operation of this site to [email protected].